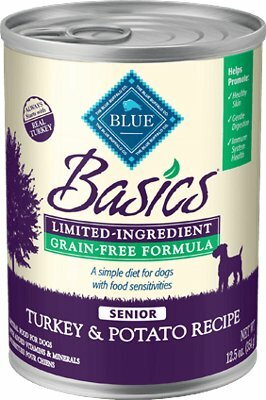 Grain-Free Blue Basics is a limited-ingredient diet formulated to minimize food sensitivities that some dogs experience while maximizing the nutritional value they receive. Blue Basics contains turkey and potatoes and leaves out corn, wheat, soy, dairy and eggs - ingredients known to cause allergies in some dogs. A precise blend of veggies, fruit and micronutrients - these ingredients were selected for their nutritional value and their capacity to help in the digestive process. An optimal blend of Omega 3 & 6 Fatty Acids helps maintain the immune system and support skin and coat health. Plus, it’s free from the grains that contain glutens some pet parents choose to avoid. And, like all Blue pet foods, Blue Basics contains no chicken (or poultry) by-product meals and no artificial ingredients of any kind. Turkey, Turkey Broth, Potatoes, Flaxseed (Source of Omega 3 and 6 Fatty Acids), Pea Protein, Fish Oil (Sourceof Omega 3 Fatty Acids), Pumpkin, Guar Gum, Potassium Chloride, Salt, Carrageenan, Cassia Gum,Cranberries, Blueberries, Choline Chloride, Mixed Tocopherols, Glucosamine Hydrochloride, Chondroitin Sulfate,Vitamin E Supplement, L-Ascorbyl-2-Polyphosphate (Source of Vitamin C), Zinc Amino Acid Chelate, Iron Aminoacid Chelate, Copper Amino Acid Chelate, Manganese Amino Acid Chelate, Sodium Selenite, Thiamine Mononitrate(Vitamin B1), Cobalt Amino Acid Chelate, Niacin Supplement (Vitamin B3), Calcium Pantothenate (Vitamin B5),Vitamin A Supplement, Riboflavin Supplement (Vitamin B2), Biotin (Vitamin B7), Vitamin B12 Supplement,Potassium Iodide, Pyridoxine Hydrochloride (Vitamin B6), Vitamin D3 Supplement, Folic Acid (Vitamin B9). Feed 3/4 - 1 can per 10 lbs of body weight per day. BLUE Basics has a diverse selection of delectable canned canine foods and single-serve cups, all starting with real meat and the finest natural ingredients enhanced with vitamins and minerals. With flavors and recipes inspired by wholesome, homestyle cooking, you'll find a large variety of wonderful wet foods all formulated to support your dog's health and well-being no matter his breed size. Our BLUE Basics limited-ingredient wet diet is ideal for dogs with food sensitivities. Made with high-quality single animal proteins not typically used in dog food, there's nothing basic about the taste of these delicious wet formulas. Choose from several offerings specifically formulated to meet the nutritional needs of adult dogs including small and large breeds, as well as senior formulas. My dog was having trouble going to the bathroom when eating her wet and dry food. Since she has got older it just bloated her and she was always sick. 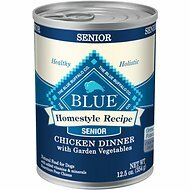 This new food, Blue Basics for seniors, did the trick. she has not been sick, or constipated at all. Her stomach is not even bloated. She looks good and feels great!! I have been struggling to find a dog food that my 16 year old toy poodle would like. 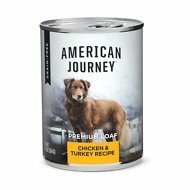 This soft dog food is great. She doesn't have diarrhea anymore and she's actually eating it. I would recommend this dog food to anyone that has a dog with intestinal problems. Koko's vet even approved of it. My 14 year old Borador absolutely loves this dog food. Ive been feeding him the dry Turkey and Potatoe - Limited Ingredient - Grain Free food by Blue Buffalo which he likes. Ive started mixing in a half can of this wet food with his regular dry food and he loves it. He does bonkers at dinner time and cant get to the bottom of his dish soon enough. It even smells decent and i can i recognize real parts of potatoe in the food which i like. I highly recommend and am going to continue purchasing for my handsome old man! Unfortunately for me, my dog likes a firmer texture, but it could be a good option for a senior dog with teeth or mouth issues. Nutrition seems solid. I have two senior teacup poodles who always have been very picky with their food and treats. They have been having some digestive problems with the regular Blue Buffalo with their bowels so I tried the senior Basics and it has solved the problem and they love it. I will say they have been on blue buffalo for several years with no problem so I am sure their age was the factor. I mix the dry with the moist. They also love the treats. My dog Mo loves the BB and looks better than ever. His coat is shinier and he is slimming down. My dog with no teeth loves this and so does his body. Helped get rid of his constipation. We order only this particular food to support our little dogs medical condition and luckily he likes it. Chewy consistently stocks it, delivers quickly and in good shape. This is the second flavor of senior food from Blue Buffalo that I have tried on my Pup. He really likes it so I now have two flavors for him. Thank you so much for helping me feed my sweet boy. My 3 dogs have been driving me crazy with their pickiness! Been through all kinds of dry food,including some very costly brands. They refuse unless they are really hungry. I finally relented and moved to wet food. They sure gobble this particulat one down and lick the bowl. Hope it continues.